There are cases when you need to calculate very large numbers (e.g. the distances in space), or, conversely, very small numbers (e.g. the distances in microcosm). In this regard, Unigine features a 64-bit double-precision floating-point format (instead of the 32-bit single-precision one) to define coordinates of objects in the virtual scene. Therefore, it is possible to create highly detailed virtually unlimited worlds (the maximum coordinates values are effectively 536,870,912 times larger than for the 32-bit float precision). In reality, float precision limitations are noticeable even on scenes larger than 10x10 km due to the accumulation of positioning errors, so double precision should be used for anything larger to maintain accuracy. where base is equal to 2. The possible values range for single and double precision, as well as the minimal possible gradations are shown at the picture below. Values range: [-10^9;+10^9]. The lower and higher values will be displayed as inf. The maximum quantity of the numbers in the fractional part cannot be more than 3. Values set by means of UnigineScript functions have only format's limitations. Usage of a single precision floating format leads to inaccurancies in calculations shown below. 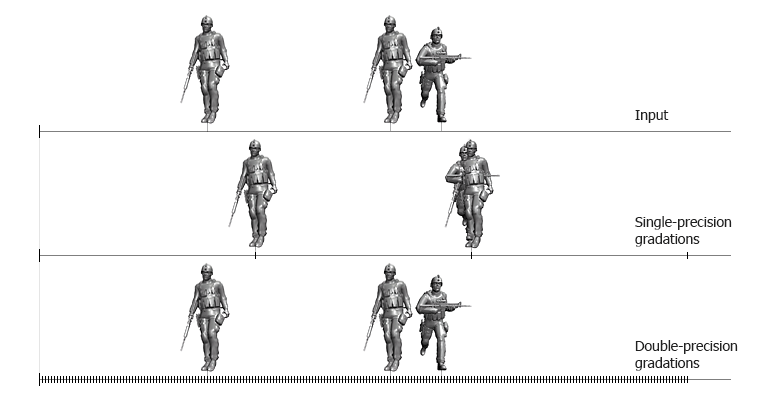 In the virtual scene, object transformations (including locating, rotating and scaling), animation and physics implementation lead to a positioning error, which, in turn, cause objects jittering. To avoid this problem and to provide far more precise positioning, use the double-precision floating point coordinates. Besides, positioning errors may lead to a vertex collapse that can be schematically seen at the picture below. The maximum absolute error for a number is equal to the half of the possible gradation. As the possible gradation is doubled when the exponent is incremented, the error is increased too. The gradation of the numbers equals to 2 ^ (E-150) for single-precision numbers, and 2 ^ (E-1075) for double-precision numbers. Lets compare the 1 value for both single-precision and double-precision numbers. According to the distribution, the gradation values are increasing, which leads to the error increase. But in comparison, the double-precision numbers error is many times less than the single-precision numbers errors.